1972,	Mr Jet Moore edges Kaweah Bar and Charger Bar to capture the inaugural running of the Champion Of Champions. 1976,	Dash For Cash sets the track record with his :21.17-second victory. The winning margin of 1 3/4 lengths is one of the biggest margins of victory in this race. 1977,	Dash For Cash becomes the only two-time winner of the race. 1979,	The former claimer Mr Doty Bars pulls off the biggest upset in the Champion Of Champions when he earns the victory at 22-1. 1981,	Denim N Diamonds defeats arch rival Sgt Pepper Feature. 1982,	Sgt Pepper Feature captures the race, nosing out longshot My Startime, with Denim N Diamonds finishing third in her final career start. 1985,	Cash Rate captures the race in :21.31 seconds. 1990, Dash For Speed wins to give jockey Kip Didericksen his first Champion Of Champions win. 1992,	Jockey Kip Didericksen who earlier in the month had retired, returns to guide the 4-5 favorite Refrigerator to victory. 1993,	Refrigerator becomes quarter horse racing's all-time leading earner by winning his second consecutive Champion Of Champions. Refrigerator also becomes just the second horse to ever win back-to-back Champion Of Champions while earning his second straight world champion title. 1994,	Making his fourth start in this event, Refrigerator wins his record third consecutive Champion Of Champions. Jockey Bruce Pilkenton picks up his fourth win. 1995,	My Debut wins his fifth straight race at Los Alamitos on his way to being named Champion Aged Horse/Gelding. My Debut gives trainer Blane Schvaneveldt his ninth Champion Of Champions win. Refrigerator, in his fifth Champion Of Champions, finishes eighth in what would be his final start. 1996,	Dashing Folly finishes the 1996 racing season undefeated and later becomes the 16th Champion of Champions winner to be named World Champion Quarter Horse. 1997,	SLM Big Daddy solidifies World Champion honors with a powerful win. Aided by a sealed track and a slight tailwind SLM Big Daddy's :21.20 clocking is the second fastest Champion Of Champions of all time and the fastest ever under the lights. 1998,	SLM Big Daddy becomes only the third horse to ever win back-to-back runnings of the Champion Of Champions, earning his second straight World Champion title in the process. 2000,	A Ransom led every step of the way to become the first Champion of Champions winner to go undefeated for the year since World Champion Dashing Folly in 1996. 2001,	Tailor Fit upset reigning World Champion A Ransom to win the 30th renewal of the Champion of Champions. Tailor Fit is only the fourth horse to win the prestigious Champion of Champions more than once. 2002,	Whosleavingwho recorded the third fastest time ever in the 440-yard classic for older Quarter Horses. Whosleavingwho beat former claimer Runahalf by 3/4 lengths while covering the distance in :21.27. 2003, In only his third start of the year, the 15-1 longshot The Down Side posted the second fastest time in the history of the Champion of Champions. The Down Side also became the first ungelded horse to win the Champion of Champions since Special Leader in 1991. 2004, Sent off at 21-1 odds, Ed Calvert's Cash For Kas recorded the second biggest upset in the $500,000 Champions of Champions while giving trainer Paul Jones his third straight win in the Champion of Champions. Cash For Kas is the first 3-year-old filly to win the Champion of Champions since Dashing Folly. 2005, Ocean Runaway capped a season in which he finished first or second in all eight of his start by winning the $500,000 Champion of Champions over longshot Like Frankie And Me and eventual champion 3-year-old filly Apollitical Time. Ocean Runaway is the third 3-year-old in a row to win the Champion of Champions. He is also the third straight runner to win this race by qualifying via the Z. Wayne Griffin Directors Trials. 2006, Racing on a rainy night, Wave Carver edged Be A Bono by a nose en route to winning the Champion of Champions. Be A Bono becomes the first horse to finish second twice in the Champion of Champions. 2007, Blues Girl Too posted one of the most impressive performances of all time at Los Alamitos as she set the track record with her :21.13-second victory. She also became the second richest Quarter Horse of all time and the richest ever female in history. 2008, Jess You And I After a great battle with Little Bit Of Baja, Jess You And I becomes the first horse to run 440 yards at Los Alamitos in under 21 seconds on the way to winning the Champion of Champions. 2009, Freaky posted a phenomenal victory with the second fastest running of the Champion of Champions of :21.06 en route to becoming Quarter Horse racing’s World Champion sprinter. 2010, Apollitical Jess completed one of the greatest autumn seasons ever at Los Alamitos Race Course by winning the $750,000 Champion of Champions in track record time while also defeating a field that included World Champion Freaky and the millionaire Jess You And I. 2011, Good Reason SA joined Ocean Runaway and Blues Girls Too as the only Los Alamitos Two Million Futurity winners to win the Champion of Champions after edging Sparky E Boy by the narrowest of margins in the 40th running of the Champion of Champions. 2012, Rylees Boy at the age of 7-years-old became the oldest horse to ever win the Champion of Champions after defeating a field that included eventual 2012 champion 3-year-old filly Flame N Flash, eventual 2012 champion 3-year-old colt Hez Our Secret, 2011 World Champion Cold Cash 123 and more. 2013, Last To Fire* posted a dominant effort, while recording a 1 ¼ length victory while covering the 440 yards in the event’s fourth fastest clocking. 2015, Heza Dasha Fire* completed a marvelous and unbeaten season with an easy win over champion Moonist on the way to being named AQHA World Champion. 2016, Zoomin For SpudsA winning maching at Los Alamitos, Zoomin For Spuds scored a total of six starts win at the Orange County oval in 2016 highlighted by his upset win over defending Champion of Champions winner Heza Dasha Fire. 2017, Mr PYC To Youscored the biggest upset in Champion of Champions history when outdueling Heza Dasha Fire to win the 45th running at 61-1 odds. Defending winner Zoomin For Spuds finished a strong third. 1983 Justanold Love :21.68 $200,000 Bruce Pilkenton Charles Cascio J.E. Jumonville, Jr.
1996 Dashing Folly* :21.70 $300,000 Tami Purcell Donna McArthur Jaramar Ltd.
2005 Ocean Runaway :21.20 $500,000 Alex Bautista Denny Ekins Muller Racing LLC. 2015 Heza Dasha Fire :21.20 $600,000 Cruz Mendez Jose Flores S-Quarter K Racing LLC. 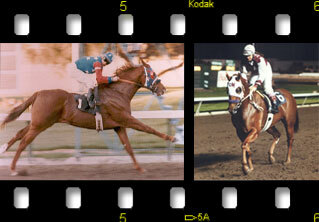 The Champion Of Champions became the sport's premier race in 1976 when Dash For Cash set a track record :21.17-second victory. Dashing Folly completed her undefeated 1996 season by winning the Champion of Champions. She won all 10 of her starts that year.